Our lodging in Williams, California is not your average highway-side inn. Our light-filled rooms and suites feature modern décor and a stylish, warm color palette to welcome you into a cheerful home away from home. At the end of a long day on the road, stretch out in your room’s plush bed and cozy up with premium linens. Flip through the channels on a flat screen TV with premium channels, read a book in the reading chair, work at the desk. Store your purchases from Granzella’s in your room’s refrigerator! Our rooms are set up for travelers of all types. All our guests enjoy our high-speed Wi-Fi, perfect for connecting back home or to the office. Get some work done sitting on your room’s ergonomic desk chair. Visiting with your whole family? Our Presidential Suite has two separate rooms for added privacy, dividing a bedroom with a king bed from the living room with its pull-out sleeper sofa. 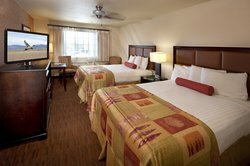 We guarantee the best rate for lodging in Williams, California when you book directly with us! You can also call to make a reservation at 1-800-643-8614. Settle in to one of our inviting Single King Rooms, featuring a plush bed with crisp linens, televisions with premium cable, cozy reading chairs, modern décor, refrigerators, complimentary toiletries, and ergonomic workstations. Unwind in one of our spacious Single King Mini Suites, featuring an extra-large sitting area with an adjacent wet bar. The lavish King bed has premium linens with a nearby television with premium cable, so you can kick back and truly relax. Get comfortable in one of our beautiful Double Queen Mini Suites, featuring a large sitting area and two plush beds with crisp linens. Perfect for larger groups, with space to relax in the separate sitting area with a comfortable couch and chair. 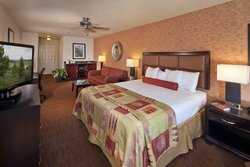 Relax in one of our stylish Double Queen Rooms, featuring two plush beds with crisp linens, televisions with premium cable, cozy reading chairs, modern décor, refrigerators, complimentary toiletries, and ergonomic workstations. 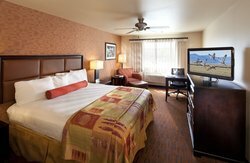 Spread out in our spacious two-room Presidential Suite, the most luxurious lodging in Williams, California. 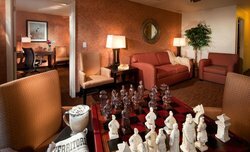 This suite features a plush King bed with crisp linens, a separate living room with sofa sleeper, television with premium cable, cozy reading chair, modern décor, refrigerator, microwave, wet bar, complimentary toiletries, and an ergonomic workstation. 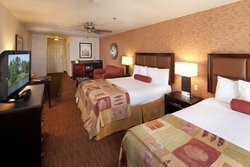 Relax in one of our stylish Double Queen Rooms, featuring two plush beds with crisp linens, televisions with premium cable, cozy reading chairs, modern décor, refrigerators, complimentary toiletries, ergonomic workstations, and accessible clear floor space. 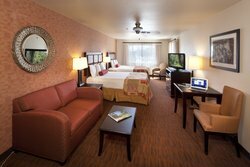 Settle into one of our inviting Accessible King Rooms, featuring a plush bed with crisp linens, televisions with premium cable, cozy reading chairs, modern décor, refrigerators, complimentary toiletries, ergonomic workstations, and accessible clear floor space.